Interview with Bant Magazine to mark the 5th Anniversary of Occupy London. Back in September I was contacted by Ekin Sanaç from the Turkish publication Bant Magazine. We conducted an interview over email about my 2011 project ‘Occupied Spaces‘. 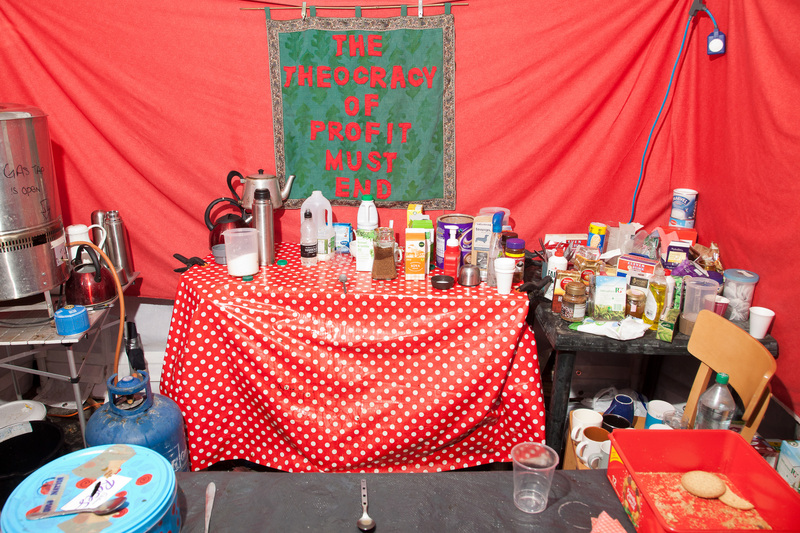 This autumn marked the 5th anniversary of the Occupy London protest and camp outside St. Paul’s cathedral, and it was a good moment to reflect on both the protest and the body of work which eventually turned into a successful book, published by HERE Press. The interview has been up on the Bant Magazine website for a while now – if you can read Turkish then head on over, but I’m guessing that most people reading this don’t have great Turkish skills, so here’s some excerpts from our discussion. Erin Sanaç (EK): You have been interested in focusing on photographing the camp after the occupation was demeaned by the media. What exactly triggered you? Ben Roberts (BR): I’d passed by the Occupy London camp on a number of occasions on my bicycle, and it had always appeared to be a hive of activity. When some of the right wing newspapers (The Telegraph and the Daily Mail) ran a story claiming that the majority of the tents were not inhabited overnight, I just didn’t think this was plausible. The media used photographs taken with a ‘thermal imaging’ camera to show the tents without people sleeping in them, but there was no scientific explanation as to how accurate these images were, or when they were taken. I’ve always loved camping and have slept in tents on countless holidays and adventures. I figured that by simply looking at the contents of a tent I would be able to see if it was being occupied on a regular basis. 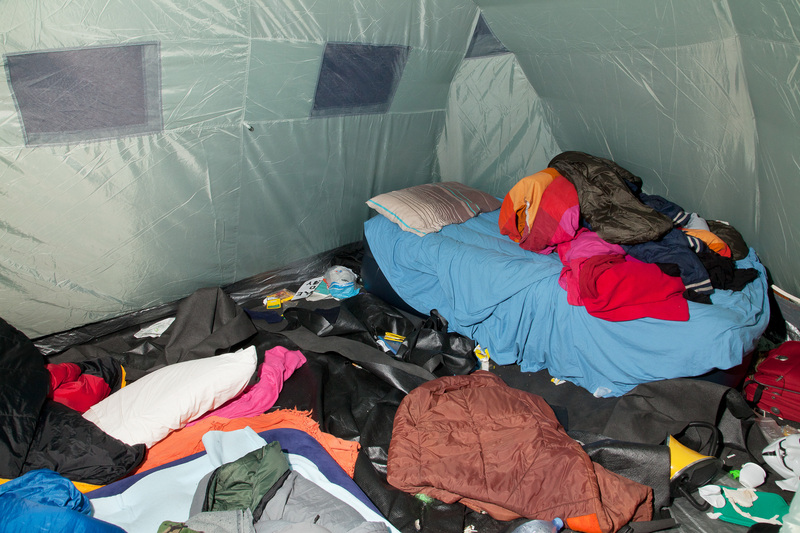 It struck me that a series of stark, architectural photographs of the tent interiors could be an effective way of countering the supposedly incriminating images run by the media. The traces of humanity in the photographs would offer decisive proof that the camp was occupied. EK: How did you approach this series from a compositional and photographical point of view? BR: At the time of making this work, I had a full time job as a photography technician at the University of West London and was also training for the London marathon. It was a busy time, and I knew that I had limited time for pursuing personal project so I was very keen to shoot the whole series in one evening. Due to my 9am-5pm working hours, I was only able to photograph at the camp in the evening, so it was inevitable that I would be working in the dark. I decided to use a simple handheld technique, with an off camera flash in my left hand the camera in my right. I used a headtorch to illuminate the tents so that my camera’s autofocus would work. I knew that the use of flash would really bring out the primary colours of the tents, but more importantly it would pick out any smaller details. I tried to keep the compositions very simple and direct, always photographing from the entrance to the tent and at an eye level that anyone entering that tent would have. In the larger communal tents, this meant that I could photograph from a standing position, while in the smaller private tents I would have to photograph from a kneeling position. There is a uniformity to the work in spite of the differences in colour and content – this is deliberate, as I wanted there to be an element of typography in the images that would tie them all together as a unit. EK: Did you look for any specific things inside the tents? Or did you choose not to intervene in what the camera sees? What unexpected things did your camera reveal for you? BR: All of the spaces that I photographed were shot ‘as found’. 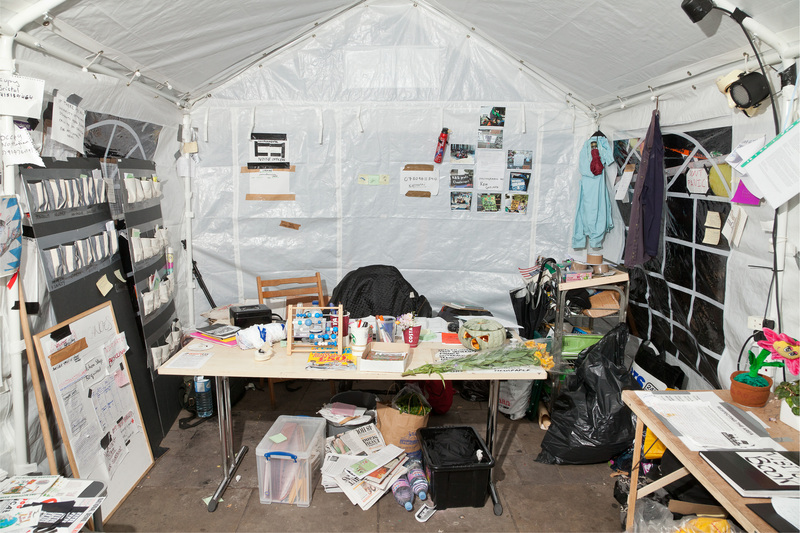 In the only exception to this rule, ‘The Peace Tent’, the owner of the tent was keen to organise the sleeping area a little bit in advance of the photograph. I felt like it would have been unreasonable to object to this. 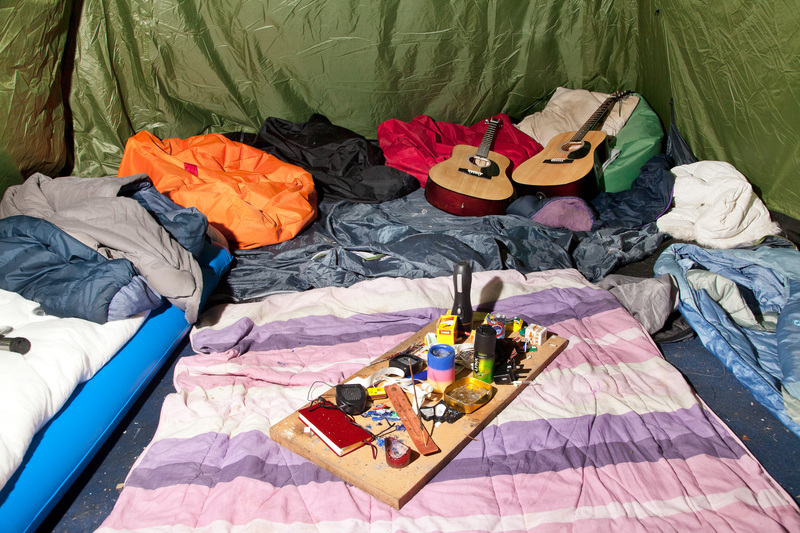 In this series I was hoping to capture the slight feeling of disorganisation that is inherent in camping. You have a limited space in which to sleep, get changed, and store personal belongings. 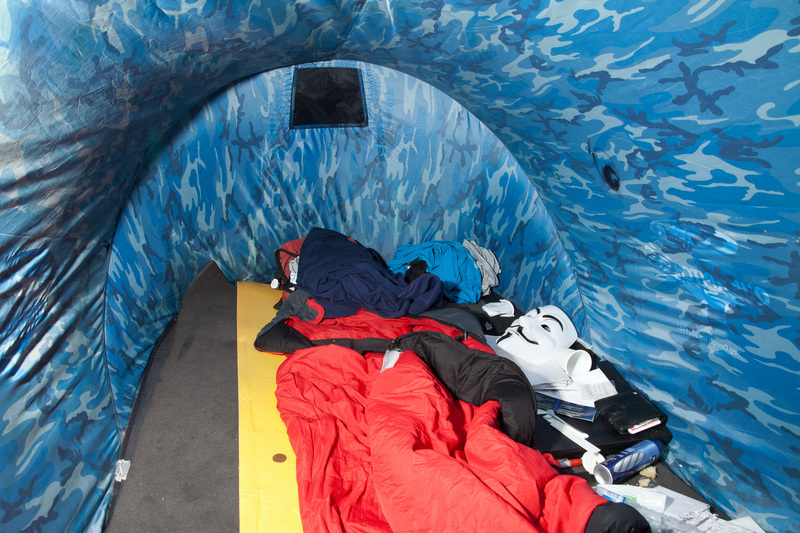 Over an extended period of time, the majority of campers will become a little more laissez-faire in the organisation of their personal space. 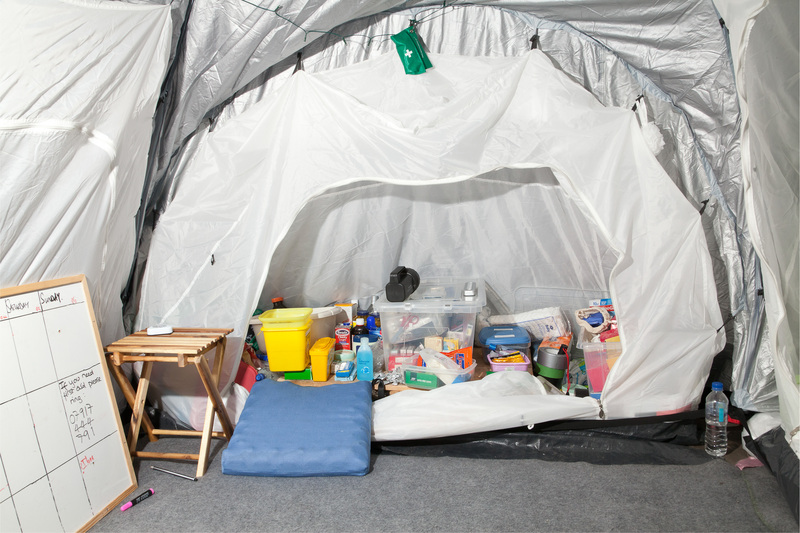 While individual items may have their space, a totally clean and organised tent is a rarity. I love how some of the photographs benefit from a closer look. The communal spaces in particular contain a complex ecosystem of artefacts built up by successive users, items left behind or forgotten by any one of a multitude of users. The tapestry of objects includes a bunch of flowers, cigarette butts, a self-help book, a sign saying ‘NO PHOTOS’ and a printed article with headline ‘How to cope with being attacked by the police and other assailants. In one tent, a note reads ‘Eat Me’ with a smiley face; scrawled underneath in a different hand, a response ‘With pleasure, when are you back?’. 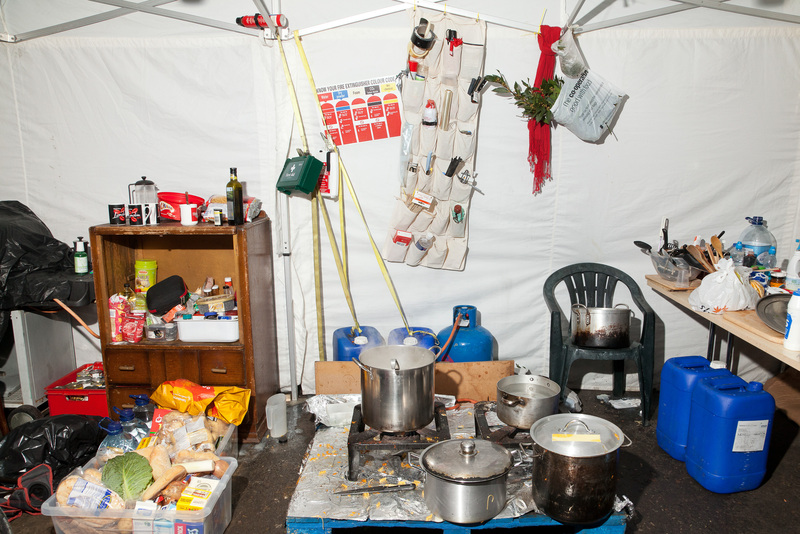 EK: What do you think you added to the standard language of protest photography with the Occupied Spaces series? BR: I’m hesitant to make any lofty claims about where these photographs sit in the canon of protest photography, however I consciously wanted to avoid the expected stereotypes of this genre – the inevitable photographs of protestors clashing with police, of people chanting and holding signs. While these kinds of images are important and play a role in contextualising protests for the public, at contemporary protests it can feel like there are as many people documenting as there are actually protesting. I wanted to take more of a detached and analytical approach as opposed to reacting in a more emotive way to specific events and moments. 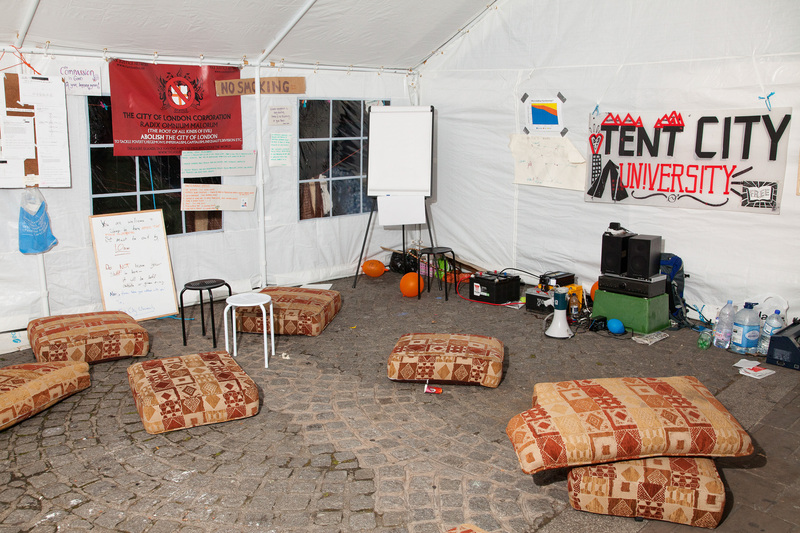 The Occupy Movement was in itself a different phenomenon to the majority of modern day protests, extending over months as opposed to being on a particular, planned day. A result of this longer time frame was the creation of an infrastructure and a community that lent itself to being documented in new and different ways. I felt like it was important to record some of these temporary constructs in a clinical fashion. I definitely wanted to create a body of work that could be archived for historical purposes, showing how the protestors came together to create a semblance of order in a transitory space. Thanks to Ekin Sanaç for the interview! It was fun to revisit these photographs and reflect on the working process that I went through. Occupied Spaces was published by Here Press in 2012 – both the first and second editions have sold out at source, but DonLon Books have a first edition available in good condition.